Dorothy Mae Robertson departed this life on September 29, 2018 at Chase City Rehab. She was born February 13, 1938 in Blackstone, VA. She was raised by James and Mary Patterson in Blackstone. Dorothy attended school in Nottoway County and later moved to New York where she received a degree in nursing. She then returned to Blackstone for a while. Dorothy later moved to Washington, DC where she worked at Washington Memorial Hospital. She returned to Blackstone and later moved to Victoria. After a while she decided to move back to Blackstone which was her final destination. Dorothy Mae always had a smile on her face, was very kind hearted, but do not cross her. She loved playing Bingo and baseball. Dorothy was preceded in death by her parents; brothers, Milton and James Stewart; and sister, Dora Bonman. 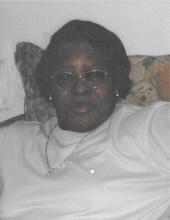 She leaves to cherish her memory: one devoted son, Timothy Robertson; six grandchildren, Darnell Pettis (Lil Tim), Kei Marshall, Deanne Hardy, Trevaun Jennings, Olivia Robertson and China Thompson; a host of great grandchildren, nieces, nephews, cousins and friends; devoted great cousins, Rebecca Pritchett and Chantay McCrae. Funeral Services Friday, October 5, 2018 at 1:00 p.m. at W.E. Hawkes & Son Funeral Home, Blackstone. Interment Greenview Cemetery, Blackstone. To plant a tree in memory of Dorothy Mae Robertson, please visit our Tribute Store. "Email Address" would like to share the life celebration of Dorothy Mae Robertson. Click on the "link" to go to share a favorite memory or leave a condolence message for the family.